Otobong Nkanga: Solid Maneuvers, Courtesy Christine Clinckx. Otobong Nkanga (b. 1974, Kano, Nigeria; lives and works in Antwerp, Belgium), an artist who works across multiple mediums that include drawing, video, and sculpture, performs Solid Maneuvers. The work considers how machinery used for mining the landscape is informed by the physical gestures of the human body. Tracing the transition from early hand-tools to modern heavy machinery through their mechanical and repetitive movements, Nkanga’s performance directly engages with her sculpture in the exhibition through enacting seven specific gestures. Solid Maneuvers is part of MCASB’s Beyond 2° exhibition, on view at our main space galleries. 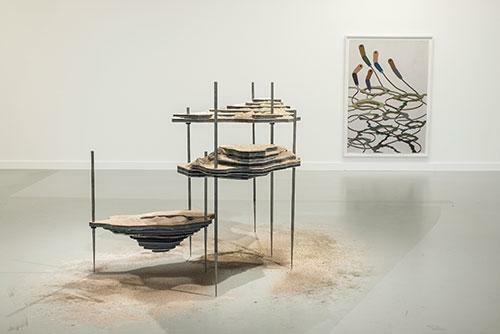 The exhibition features contemporary artworks that address various systems perpetuating global warming and those systems’ impact on local ecologies. This event marks MCASB’s ongoing commitment to performance via our On Edge Performance Art Series and is funded in part by the National Endowment for the Arts.